Getting a tooth pulled is unpleasant, but extraction can sometimes be required to avoid future complications. For safe and careful extractions, trust Herb Bennett, DMD and the knowledgeable team at HB Dental in Leesburg, Florida. We're here for you when you're in need of tooth extraction. Call the office or schedule a consultation online. Your permanent teeth are designed to last a lifetime, but for numerous reasons, some may not. For instance, a tooth may need to be extracted because it's too diseased to keep. Lifestyle choices, trauma, and decay can all lead to needing a tooth pulled. There are two types of extraction procedures: a simple extraction and a surgical extraction. Simple extractions are just like they sound. They're simple! 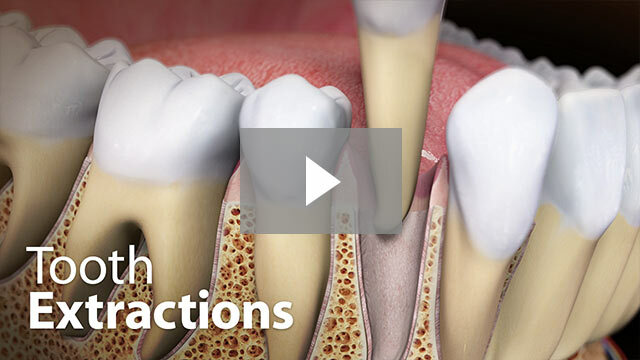 Simple extractions are performed on teeth that can be seen in your mouth. In a simple extraction, a highly experienced dentist at HB Dental will loosen the tooth with an instrument called an elevator and gently remove it with dental forceps. A surgical extraction can be more invasive. The tooth may have been broken off at your gum line, or it hasn’t yet come through the surface of your gums, as is typical with wisdom teeth. In these cases, Dr. Bennett makes a small incision in your gum to remove the tooth. It may be necessary to remove some of the bone around your tooth as well so it can be thoroughly extracted. Dr. Bennett gives you an injection (a local anesthetic) to numb your mouth before a simple extraction or surgical extraction, so you shouldn't feel any pain. If you're having a couple of teeth removed at one appointment, as is the norm with wisdom teeth removal, he may give you a general anesthetic. You'll sleep and be pain-free throughout the whole procedure. Because everyone's circumstances are different, you should reach out to HB Dental to book a consultation so you can discover your options and any necessary follow-up procedures like crowns or dental implants. Make an appointment online or call HB Dental today.